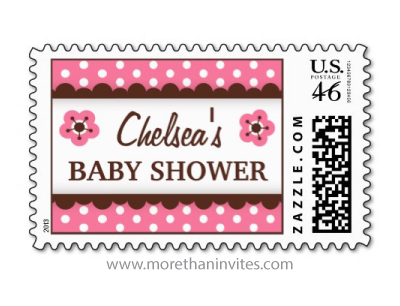 Cute, personalized baby shower postage stamp featuring a pink and white polka dot pattern and a horizontal brown band with scalloped edge and little flowers. Customizable text “[Name’s] baby shower. Chic and trendy baby shower postage stamp for mothers expecting little girls.